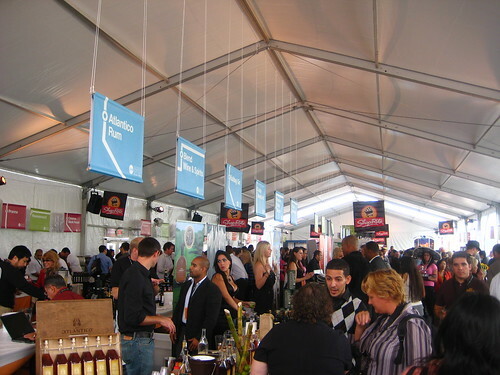 The Grand Tasting. It sounds important, it looks overwhelming, and involves a lot of wine and food. 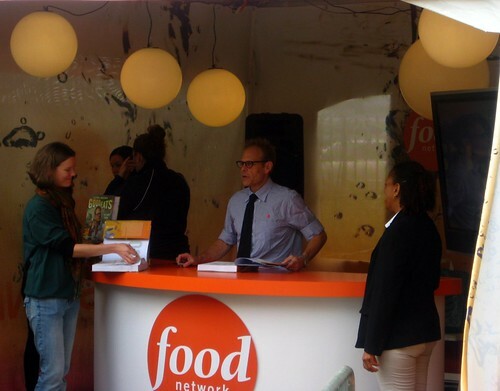 My first experience was that Saturday Morning's Grand Tasting, directly after the Alton Brown book signing. Note for Future Grand Tastings: make sure you pick up your wine glass, there are very few other ways to partake in the imbibing. On that thought, make sure you plan out your drinks; the choices spanned many alcoholic genres and no one wants a rumbling tummy. My little misstep left me to only focus on the food. Of course almost everything was above average or excellent. 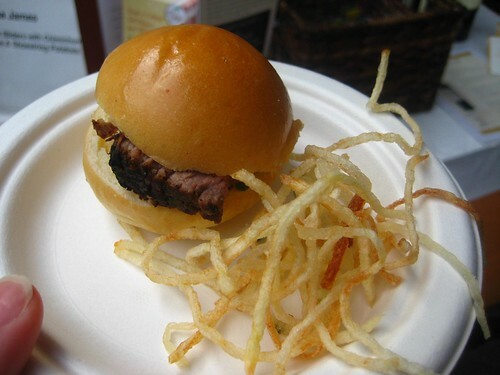 The very first thing I tried ended up being one of my favorites for this day, a steak slider from The Palm Tribeca. 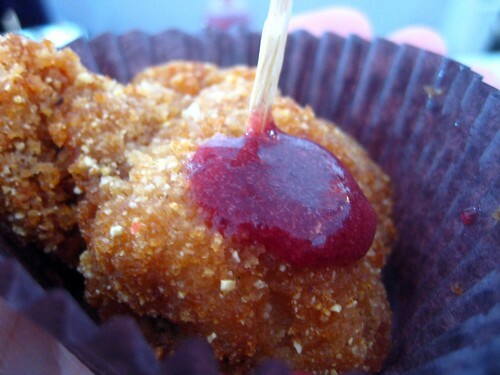 Another notable was the Viennese Fried Chicken with Lingonberries from Klee Brasserie. Salty and sweet, the fried chicken held up remarkably well making me curious to know how much better it would be straight out of their kitchen. 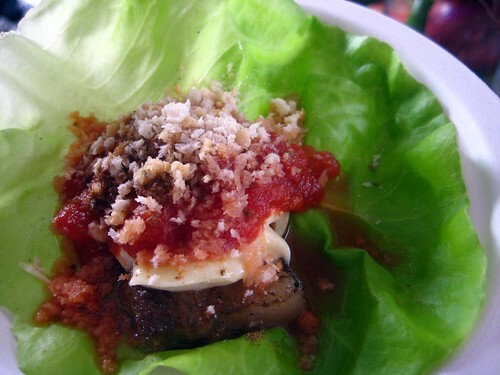 Rounding out my top three from this day was the BLT lettuce wrap from Bobo. Bershire pork was a creamy layer of fat, rich tomato flavor, I would have loved it in toast, but this was delicious. 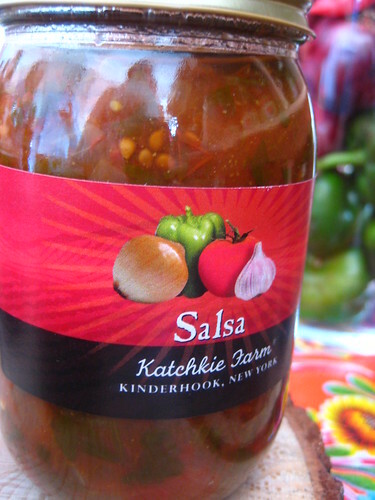 While I was there, I was able to stop by Katchkie Farm's stand and taste some of their new products namely the salsa, the salsa that I ate about half a jar of. The salsa I waxed poetically about to Brownie. The salsa that had chunks of vegetables, spicy, but not mouth en fuego. The salsa that is now my favorite. I was also delightfully surprised by the number of chefs that appeared to hand out their food. I had expected them to hand this off to junior staff, but some well-known chefs were there, smiling and friendly. Pick up produce and products from Katchkie at the Port Authority Greenmarket on Thursdays or at the monthly New Amsterdam Market-the next one is November 22nd. Damn, ma'am, that fried chicken looks insane. Was it bone-in or -out? Sounds like some 5-star snacks. Was there any sweet along with the savory?